Workplace violence and background checks. Lodi. Offering copywriting, editing, research, translation. Lodi, CA. Specializing in wedding and special occasion photography. Based in Lodi, CA. Manufacturer of storage platforms, pallet rack and hoppers. Product images and descriptions. Lodi firm offering traditional accounting services. Includes financial tips and answers to FAQs. provides bulk transportation services to the glass and glass container industry. located in lodi, california. Offers personal and business banking to Sauk City and Lodi, Wisconsin. Services all legal documents in Lodi, Ca. Providing production needs for corporate meetings, special events, trade show booths from one location. Lodi, CA. Offering support in the administrative, marketing, and graphic design fields. Local on-site assistance available for Sacramento, Lodi, Stockton, Modesto, and Tracy. Business profile, services, and contact information. sells and services truck equipment including cranes, lube bodies, air compressor systems, dump bodies, conversion hoists, tool and storage boxes. based in sacramento, ca. 14 Lodi Sausage Company Lodi, Wisconsin. Lodi, Wisconsin. Offers summer sausage, ring bologna, bratwurst, wieners, Polish sausage, ham, and bacon. Baskets, trays, and gift tins with a variety of themes. Syrah and Shiraz winery. Wine and gift shop. Lodi appellation. Promoting wines and wineries of the Lodi region. News, grower profiles, winery list and tasting map. Giving race results, schedules and news about this quarter mile clay circuit in Lodi, North Carolina. Photographs and litter announcements. Lodi, California. Lodi producer of value priced wines. Located in Lodi. Posts map, rates, attractions and travel information. Produces Zinfandel from Lodi and Amador. Features product details, an order form [PDF format], and excerpts from reviews. Photographs, pedigrees, show news, rescue information, breeding plans, and a photograph album. Lodi, California. Makes Zinfandel and Chardonnay in Lodi. Includes descriptions of the wines, winemaking, and history. Also lists events and retailers. Standing Zippin Bonanza Flash. Offers information on stallions at stud, winners, and horses for sale. Located in Lodi. Brewpub provides its food and beer menus, photographs, map, and job openings. Located in Lodi, and operated by two brothers, produces a range of red and white varietal wines. Contains a winery history, an award list, and event information. Breeding for working ability and confirmation. Breeding plans, photographs, and video clips. Lodi, California. Information on safety training and courses for OSHA Audits. Based in Lodi, New Jersey. Robert Mondavis Lodi vineyard and winery. Description of wines produced, visiting hours, and events. Standing bay tobiano at stud. Includes sales list, photos, and profiles of horses. Located in Lodi. Family owned and operated facility with Straight Egyptian Arabian Bloodstock. Standing Royal Phariel, double *Pharrah stallion and Sihr Fanous. In Lodi. Lodi producer of Zinfandel, Chardonnay, and Merlot. Contains winemakers notes, online purchasing, winery photos, and regional event information. Rescuing and placing cats in caring homes and promoting spay/neuter. Calendar of events, pet tips, feline humor, and photographs of cats available for adoption. Lodi. Was formed in 1989 to encourage and promote RC model airplanes. Club contacts and information with member and model photos. The California Classic and Triple Crown Pony Challenge, plus calendar of upcoming events. Facility in Lodi, California. Home of American Paint Horse Association World Champion Top Speed. Standing sorrel tobiano, bay tobiano, and miniatures at stud. Includes sales list, photos, and profiles of horses. Offers Italian charms for sale. Located in Lodi. Web page design and hosting business located in Lodi, Wisconsin featuring UNIX based hosting. Website and graphic design, Flash, streaming media, photography, maintenance, domain name registration, and search engine submission. Located in Lodi, New Jersey, United States. Lodi. A ten acre cornfield maze with over three miles of twists, turns and dead ends. Pumpkin patch, rides and parties. Lodi. Beliefs and vision, programs, activities, and audio sermons. Class descriptions and schedule of the Yoga, Tai Chi, and Meditation classes conducted in Lodi. Short biography, and a meditation on the saints life and the liturgical prayers on his feast day. By Enzo Lodi. Evangelical Free Church. Beliefs and vision, programs, activities, and audio sermons. 57 Temple Baptist Church Lodi, California. Lodi, California. Statement of purpose, schedule of services, contact information, statement of beliefs, history, staff profiles, newsletters, information on missionary activities. Lodi. Affiliated with the United Church of Christ and Disciples of Christ. Includes contact information, staff directory, calendar of events, and newsletter. SiteBook Lodi City Portrait of Lodi in Wisconsin. 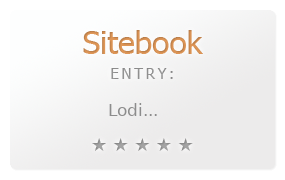 This Topic site Lodi got a rating of 4 SiteBook.org Points according to the views of this profile site.